If you are a fan of Italian food then I am sure you shopping cart is never complete until you sneak in a packet of pasta. What we love best about this form of food is that it is easy to make and healthy too. So, when your child or hubby get those crazy hunger pangs in odd hours of the day or night, the best way to please them is make them a bowl of delicious and saucy pasta. When it comes to buying pasta you will a wide range of brands to choose from. When some of them are ready to cook, others might take a little extra time. Here are is our list of top 10 best pasta brands with price in India. When you want the high quality pasta TAK Pasta Grandi is a great option. It is a purely vegetarian prodyuct and it does not contain any form of maida. It is made from purely natural ingredients. It does not contain any trans fat which means that it is cholesterol free and it can be safely consumed without fearing the risk of health. This pasta can be prepared by adding fresh vegetables sucha s tomato, carrots, beans and capsicum to enhance the taste. 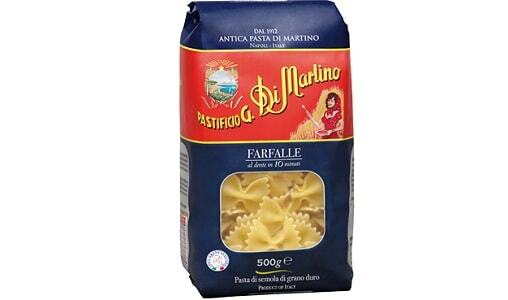 This lip smacking brand of pasta comes from the hose of Di Martino and it boasts a short cut of the hand-made pasta. These are square shaped and they are pinched in the mid to give them a butterfly pattern. The awesome design of the pasta adds to the taste and makes it look scrumptious. You can choose from the wide range of variations of this pasta depending upon your taste and preference. You can add vegetables like cherry tomatoes, basil, mint and even cheese to enhance the taste. 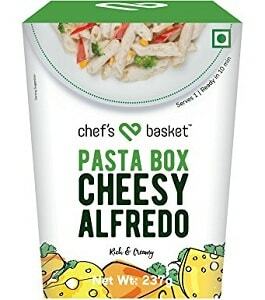 When you want a delicious and healthy mid day meal or an evening snack, Chef’s Basket Pasta Box is the perfect choice. It can be cooked in 10 minutes so it’s a favorite of moms around the world. You can serve healthy food to your child that is tasty and fulfilling too. Each pack of Chef’s Basket Pasta Box contains pasta, sauce and seasonings. The ingredients are 100% pure and natural. 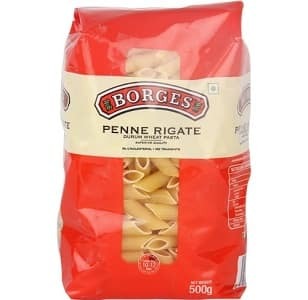 If you are health conscious and always want the best in quality for your family then the Borges Penne Rigate Durum Wheat Pasta is a great choice. 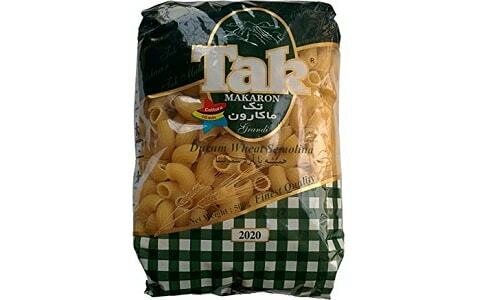 This supreme quality pasta is made from 100 percent durum wheat (semolina) which is known to have high protein content. It contains zero trans fat so you don’t have the risk of getting high cholesterol by consuming this product. 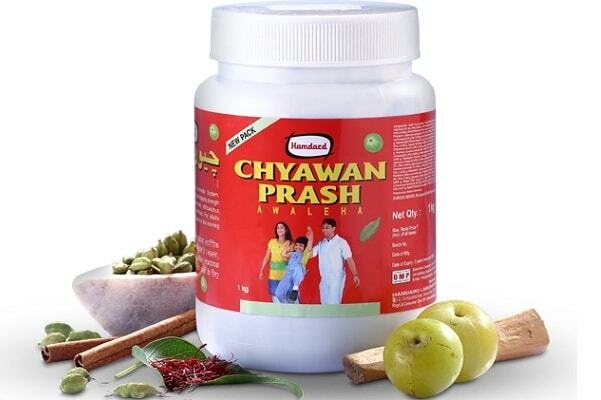 It is made using the prest form of natural products. It makes for a perfect snack, anytime. It is easy to cook and healthy for the entire family. Add lots of fresh vegetables to increase the overall value of the product and for extra flavor you may use olive oil for cooking. 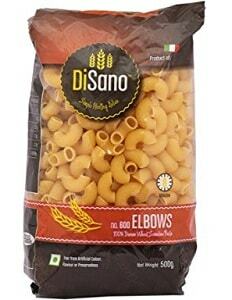 The elbows pasta are perhaps the best of all and quite convenient to cook too. They take less time to boil and get ready to cook. This is a product of Spain and it is made from the most handpicked ingredients to give you the taste of Italy right here. This is a purely vegetarian food and the shelf life of the pasta is 730 days. 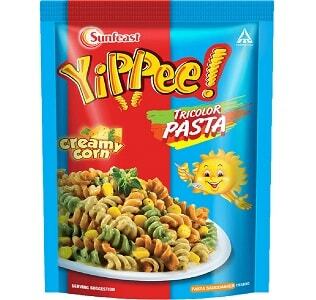 What we really love about Yippee Tricol Pasta is of course its multi color styling. It is not only delicious to eat. Besides tantalizing your taste buds, they also look really amazing. This is a ready to cook pasta that contains natural colors derived from pure and real veggies. It is the perfect healthy snack for little ones when they are hungry at odd hours of the day. It comprises of an amazing blend of wheat and delicious natural veggies. You cannot beat this incredible pasta in taste and looks. 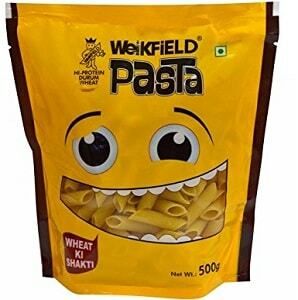 This pasta comes from the house of Weikfield, one of the popular food brands in India. The pasta is made from high protein durum wheat. It is purely vegetarian and does not contain fat so there’s no risk of getting cholesterol. If you are health conscious then this light and healthy snack will help you stay in shape. Instead of munching on unhealthy fried an oily food, make it a habit to enjoy the Weikfield Penne Pasta. You can add fresh vegetables and sauces to further enhance the taste and aroma of the pasta. Cook it in your style and give your family a truly delectable Italian treat. 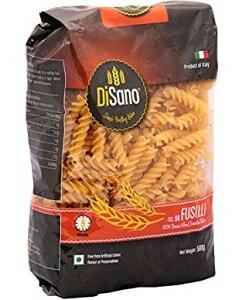 Disano Fusilli Durum Wheat Pasta comes from the house of Disano, a brand that has become popular in India for its amazing range of food. This is a product of spain and you can feel the international quality as you boil these luscious and delectable pasta. You may add your choice of vegetables (tomato, capsicum, beans, carrot), sauce and cheese to make your pasta more delicious to taste. This is a completely vegetarian dish and it has a shelf life of 730 days. 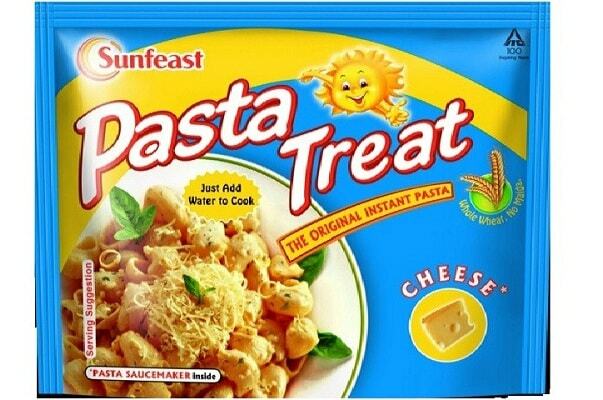 If you want to taste the Indian version of pasta then check out Sunfeast Pasta Cheese. This is an instant, ready to cook pasta that can be prepared within minutes. You can serve it within a matter of minutes and enjoy a hot bowl of delicious pasta. This product is made from the purest and most natural ingredients particularly whole wheat. This is a healthy and delicious snack option for kids and adults too. So, instead of eating oily and friend foods when you feel the hunger cravings at odd hours, try a delicious bowl of pasta and let your senses soak in the pleasure. Who doesn’t love maggi? We have all been maggi fans since our childhood and the recent range of Maggi Pazzta Masala has taken that bond a step ahead. Those who love Italian pasta have a new reason to cherish their love for Maggi. 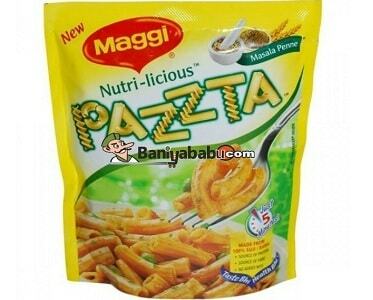 You can enjoy a hot bowl Maggi pazzta ready in minutes when you are feeling hungry. It is ready-to-cook and it includes the taste maker. So all you need to do is boil the pasta and add the taste maker to enjoy a delicious treat every time. That’s all from our end in the top 10 best pasta brands with price in India. Stay tuned for more informative articles like this.